Discussion in 'Buying Tips and Advice' started by malevolent_i, Jul 28, 2006. Anybody have ideas on a good gpu (graphics card) cooler/fan for the iMac Intel's x1600? I want to use ATITools to oc this baby (like many others have done), since it's only clocked at 310/300 (on my 17" imac), but I'm afraid the cooling's not adequate. 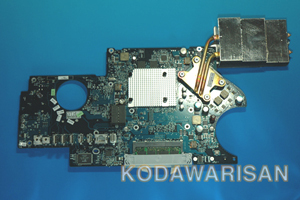 If you look at Kodawarisan's dissection of the iMac, the x1600 is only cooled by a dinky, little white passive heatsink http://www.kodawarisan.com/imac_intel/0114110.jpg. So, any suggestions on a very slim and small (but adequate) fan/heatsink? It would have to be < 1cm (10mm) thick. Do you know if the 20" is clocked higher? I wouldn't mind trying to overclock mine. Can you get ATItools for OSX? Or are you doing this in XP? I can't offer any suggestions on a better HSF, but what may be helpful is simply to use a better thermal paste, such as Arctic Silver 5. It will lower temperatures by a few degrees Celcius. You better not do it. Sorry to rain on your parade, the only machine that you should consider gaming with is either a PC, or a Mac Pro. The iMac has an integrated (as in mounted on the mainboard) graphics chip, and no PCIe expansion slots. It is also a tiny computer unlike PCs with a massive heat vent blowing exhaust out through the PSU. Quite obviously it is underclocked for a reason (ie: not burning your house down). Incidentally I also think it is spastic how Mac users can't even have a choice on which graphics card to get unless they get a top of the line Mac workstation, but who am I to complain, I am just a stupid docile Mac user. All hail Steve Jobs! lol...One of the reasons I chose this computer over the Macbook was b/c it had dedicated graphics. To my dismay, the x1600 runs games even worse than my 3-year-old p4 3.0 w/ a 9800pro. At any rate, lots of people are oc'ing their iMacs, I just want to play it safe. Lots of people are oc'ing their iMacs? Huh? Just so we are clear Mac users still constitute under 5% of the US market, and 3% worldwide. How many % of that 3% do you think are gamers? Not very many. Do what you want with your machine, just don't try to justify it. Macbook Pro has a severely underclocked x1600 GPU, a friend of mine compared it to an Nvidia Geforce FX 5700 GPU (which is 8x AGP). heh, ur being so cynical. Apparently, many people are disappointed with their imac/macbook's massively underclocked gpu: http://www.xlr8yourmac.com/feedback/Mac_ATI_X1600_overclocking.html#reports. The x1600 IS decent, but apple crippled it's clockspeed from 460core/460 mem (mhz) to 310/300 and 400/400 on the 17" and 20" imac, respectively (this is clearly sad, since the x1600xt desktop flavor is clocked as high as 590/590). AND apple "tricked" us by labelling the iMac's gpu as a "X1600", instead of a "X1600 mobility", which it is. Anyhow, the mobility has the same capabilities as the desktop flavor, but most oem's choose to clock it lower. As for the "great results", that's subjective. I got ~27 fps using the default timedemo in quake 4 (ver 1.2) at 1024*768 high quality, which is even lower than the ~33 fps i got on my 3-year old p4 with a radeon 9800pro. I cant even run half life 2 episode 1 at native resolution with the recommended settings well (<25 fps). Compared to the previous iMac G5 (x600), well, duh, it's much better, considering that u can run windows games natively. This thread is almost 4 years old. Just make your own thread under the iMac section of this forum.